Have Dairy Cattle? Have Barn Flies? The latest edition of the Oneida County Scouting Report is out and available through the Oneida County Cooperative Extension’s website. Winter wheat and barley in much of New York State are at the flag leaf emerged to boot stages of development and heads will emerge over the next week. The next 14 days will be critical for farmers making fungicide spray decisions for suppression of Fusarium head blight (FHB) and protection of flag leaves from foliar diseases. The triazole products Caramba and Prosaro are the most effective fungicides for suppression of FHB and deoxynivalenol (DON) toxin contamination when applied at wheat flowering (emergence of anthers on heads) or at full head emergence in barley (anthers begin to appear on barley before heads emerge from the boot). A flowering application of triazole fungicide should be based on Fusarium head blight (FHB) risk as well as the risks of powdery mildew, rust, and fungal leaf blotches in the upper canopy based on scouting of individual fields. There is an application window of approximately 5-6 days from the beginning of flowering in which reasonable FHB suppression can be expected. Fungicide products containing strobilurins should not be applied to headed wheat or barley as they may result in increased levels of DON in grain. While the current risk of FHB epidemics is low to moderate over most of the state, that risk could increase with warming temperatures and scattered storms forecast for the first half of next week. 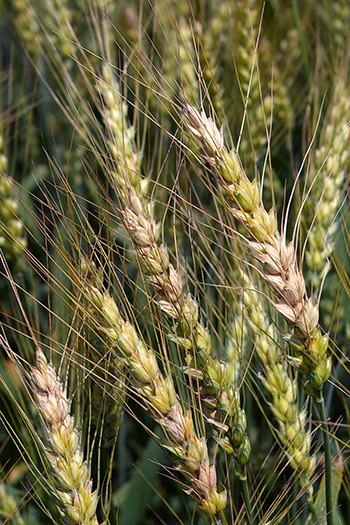 Check the Fusarium Risk Assessment Tool (http://www.wheatscab.psu.edu/) and your local weather forecast frequently as your crop approaches flowering. I will be providing weekly New York commentaries on FHB risk through mid-June. You can subscribe to receive FHB Alerts directly to your Cell Phone (http://scabusa.org/fhb_alert.php). You can select to receive alerts as 1) Text Message Alerts, 2) Email Alerts, or 3) both Text and Email Alerts. To receive alerts for New York, select the Northern Soft Winter Wheat option which provides alerts for MI, NY, WI and VT.
Last week temperatures ranged from 0 to 6 degrees above normal. Precipitation ranged from just a trace to 2 inches for most areas, with storms brining 3 to 4 inches to isolated areas. Base 50 growing degree-days ranged from 40 to 100, less than 40 in the Adirondack region. Another nice weekend ahead, unsettled weather Monday through Wednesday with locally heavy rain possible. Today will be partly cloudy with temperatures in the mid 60’s to low 70’s. Scattered showers are possible overnight into Friday as a week cold front moves across the state; lows in the mid to upper 40’s. Friday will be cloudy with a change for showers and thunderstorms – mostly east of Interstate 81, western NY will be warm and dry; highs in the mid 60’s to mid 70’s. Overnight temperatures will be in the mid 40’s to low 50’s. Saturday will be mostly sunny, breezy and dry for most areas, a few lingering showers in eastern NY; highs in the mid 60’s to mid 70’s. Lows will be in the 40’s to low 50’s. Sunday will be partly sunny and warmer with highs in the mid 70’s to low 80’s. Lows will be in the mid 50’s to low 60’s. Monday’s highs will be in the upper 70’s to low 80’s. A front will bring the chance of showers and thunderstorms. Lows will be in the mid 50’s to low 60’s. Tuesday will be in the mid 70’s and low 80’s with a continued chance of showers and thunderstorms. Lows will be in the low to mid 60’s. Wednesday’s highs will be in the mid 70’s to near 80 with showers likely. Lows will be in the upper 50’s to low 60’s. The five-day precipitation amounts will range from .10 to 0.5 inch; 7-day amounts will range from ¾” to 1 ¼”. The 8-14 day outlook (Jun 5-11) is showing above normal temperatures for the entire state and above normal precipitation for western NY and south central NY. From Kitty O’Neil, Regional Field Crops and Soils Specialist in the North Country, NY. Alfalfa and grasses are growing and maturing, despite our periodically cool and wet weather over the past week. Many fields with 50% grass or more are now optimal quality and ready for first cutting. Few alfalfa plants are beginning to bud and many grasses are heading. I’ve noticed hay down on only a couple of fields this week. 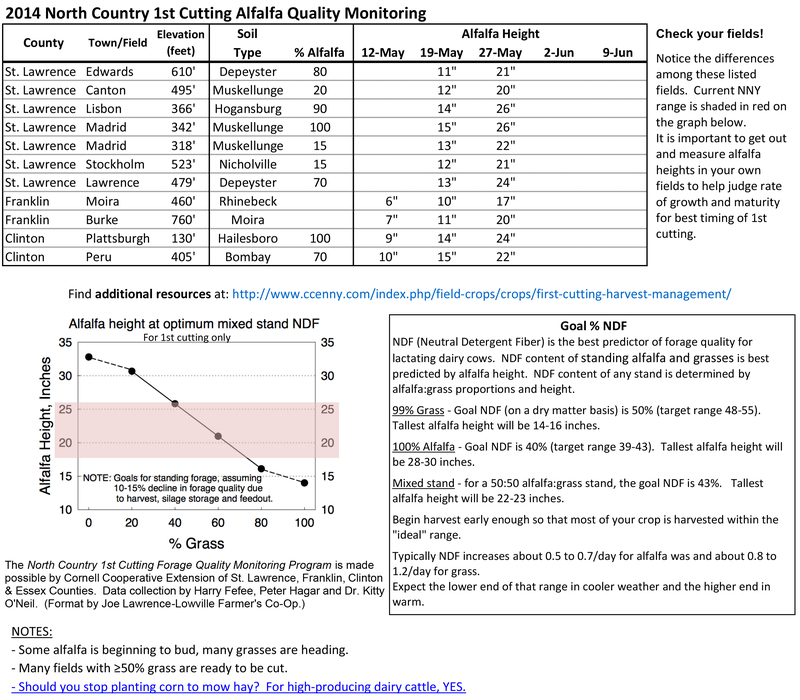 Warm temperatures this week pushed hay NDF values up almost 13 points, 1.8 points/day on average. Grasses gained just over 8 inches and legumes about 4.5 inches. We also noticed quite a bit of hay harvesting activity around the county. 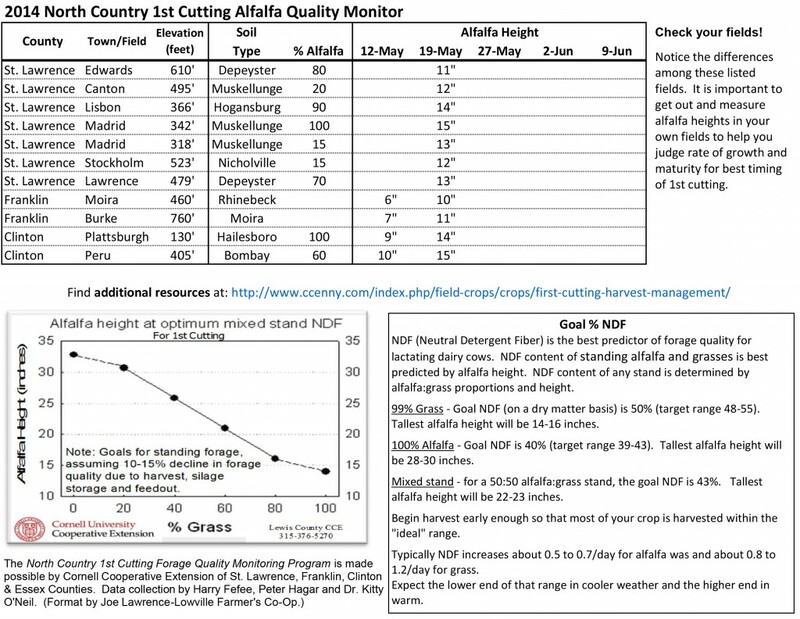 All grass fields and mixed stands with less than 50% legume sampled are now past target NDF, Mixed stands over 50% alfalfa are at target NDF, and we expect legume stands will reach target NDF within the next week. We advise Delaware County farms to proceed as quickly as possible to complete first cut of all core hay crop fields. The sample results for the 28 sites sampled are in the table below. A map of locations with sample results can be viewed at http://goo.gl/u8fxHV. Link to a pdf of the full sized version of results here http://goo.gl/FkocLo. 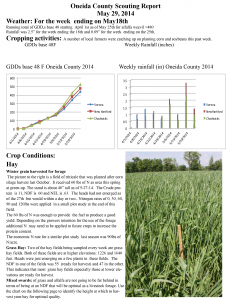 The Capital Area Ag Report for May 22, 2014 is now available online. Click here for the issue in PDF format. From Kitty O’Neil, Regional Field Crops and Soils Specialist in the North Country, NY: the 2014 season first alfalfa height report.